We’ve rung in the New Year, wished our colleagues, friends, and loved ones well, and eagerly look forward to what the future brings. What does the future hold for public relations professionals? What should we be keeping an eye on? In this series, we’ll examine a few data-driven trends that could mean success or failure for your PR efforts in 2016. We marketers and communicators have killed the infographic. We’ve fed them to every social influencer, journalist, reporter, and source in volumes so great, if we printed them out, we’d deforest the Amazon in a day. Can the news media absorb the volume of infographics we churn out? In a word, no. Above, we scanned the news to see how many times the word “infographic” was mentioned, then scanned Twitter for the same. We see that on average, traditional media references the term (meaning it appears in news coverage) about 700 times per day. 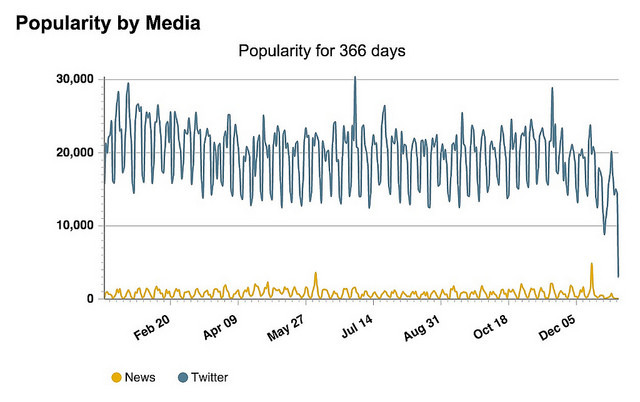 How often is “infographic” tweeted? Nearly 20,000 times per day – and in a sampling of those tweets, they’re almost entirely from marketers. 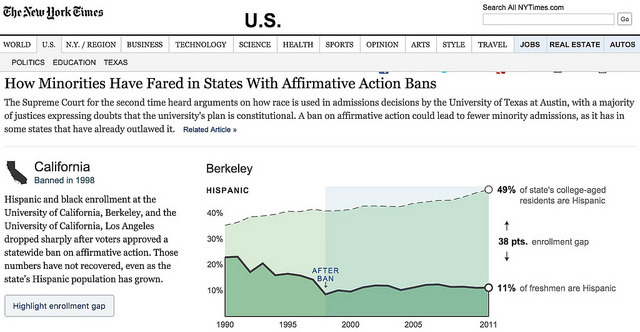 Put another way, you have about a 3% chance to place a regular infographic in any kind of traditional media coverage. Do you relish the idea of making 100 calls to promote your next infographic, only to have 3 of them be successful? What replaces the static, boring infographic? The interactive infographic. Top-tier publications like the New York Times and Washington Post have changed from static infographics to dynamic, interactive infographics powered by complex web applications. Audiences can slice and dice data to find the information they care about most. In the example above, on the NY Times website, you can switch views and look at specific points in time. What does it take for PR teams and organizations to create interactive infographics such as these? Interactive infographics are more complex to create than static images. They typically require a data analyst to gather, clean, and prepare the data for visualization. A programmer fluent in Node.js, Shiny, or other interactive visualization tools then takes the data and transforms it into interactive magic. Make no mistake: interactive infographic creation is essentially software development. If you have developers and data scientists on staff, you’ll have a substantial advantage over brands and organizations without them. Once the final product is tested and released, PR professionals can begin pitching it. Are publications, influencers, and journalists more receptive to interactive infographics? Yes. Why? As long as they meet the style and branding of the publication, you’ve saved them significant time and resources. You’ve done the software development for them. If your data is interesting, they don’t need to build their own; they can use yours. For second-tier and lower publications, they may accept the interactive app as-is because they don’t have the resources to build their own. Should you pursue interactive infographics? If you have the budget and resources to do so, yes. You’ll have a substantial advantage over companies cranking out the same old thing. This article was written by Christopher Penn from Business2Community and was legally licensed through the NewsCred publisher network.